I love it when a story grabs and holds on to you in the first few sentences. Just grabs you by the collar, shakes you, and screams, "hold on tight!" You just know that this is going to be the ride of a lifetime. 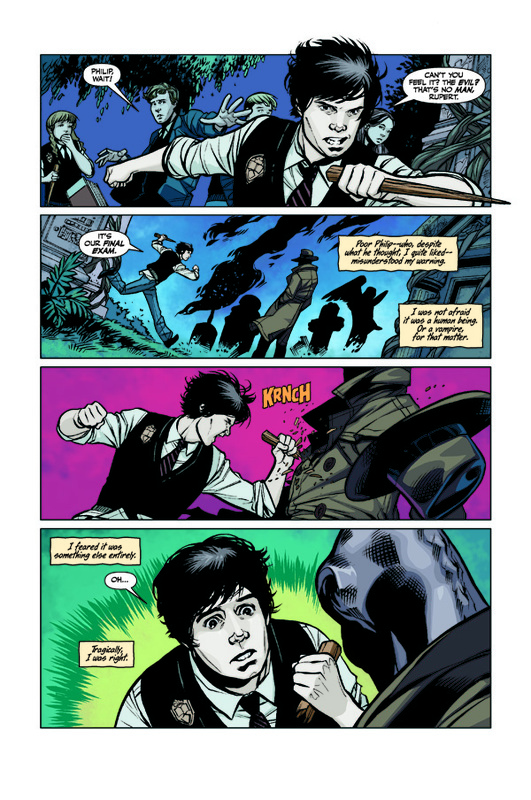 Writer, Christos Gage, does not disappoint with his opening inner monologue by Angel musing over the grave of Douglas Adams in Angel & Faith #6. The story itself is called Daddy Issues and boy is there plenty to go around. A portion of the story looks into Giles's past, his early days of learning to be a watcher, a quick introduction to some very cool characters, who (in what I call typical Joss Whedon fashion) are then killed off by a horrible beasty in a quite horrid manner. 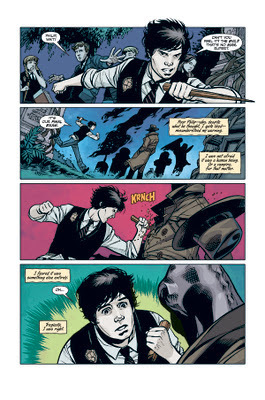 The result shows the disconnect between Giles's own father and the turning point of him becoming Ripper. Further along you discover that Faith's own father is searching for her and I am sure that is going to bring a host of nail-biting, page turning goodness. Let us not forget Angel, who discovers he has some fatherhood issues of his own to sort out that may very well center around this elusive Mother Superior who seems to be gathering a large amount of goth vampire wannabes. I adored the Buffy and Angel series when they were on TV and I am so happy that Gage is staying so true to the spirit of the characters in the show. Not to mention creating a story that I am finding very hard to keep my curious cat self from skipping ahead to see what happens next. If you read this, don't peek ahead, trust me. Let the story evolve as it's going to and let is totally and completely immerse you. You'll thank me. Artist, Rebekah Isaacs, continues to amaze me with her grasp of artistic realism. Not only does she make the characters come to life but you'll be convinced she asked David Boreanaz and Eliza Dushku to sit for her. Her portrayal of these people is so spot on its uncanny. I find myself just oggling the art as well as reading the story again and again. I'm salivating for the next issue from Dark Horse. I have, no I NEED to know what happens next!